Tombstone Application - Bombardier Aerospace | Advanced Machine & Engineering Co. When Drew Hanus, Bombardier's Methods Engineer, had a project requiring increased productivity, he turned to Advanced Machine & Engineering (AME) for Assistance. He was already familiar with their products and had previous experience with AME. Dietmar Goellner, President & CEO of AME, Alvin Goellner, Fixturing Group Product Manager, and Jim Park, AME's representative in Wichita, visited Hanus at the Wichita facility. 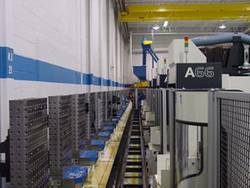 Bombardier was running 240 different parts through a cell comprised of four horizontal, 4-axis machines with a 28-pallet system and one vertical, 5-axis machine with an 8-pallet system. AME's team of experts demonstrated the advantages of sub-plates with hardened precision bushings and hardened threaded inserts on a 2-inch grid system. Hanus needed to change parts quickly from one set-up to the next, so he was shown grid tombstones and plates along with modular components, which would allow him to locate and align very accurately and quickly on a 2-inch precision grid system. Hanus purchased several full-grid tombstones to be used with their palletized system along with sub-plates, components, and precision dowel screws, which can be used for locating fixture plates onto tombstones or their pallets for quick changeover. Bombardier's pallets were shipped to AME where they incorporated bushings and threaded inserts along with locating and mounting holes. 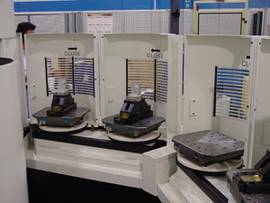 A 2-inch grid system was integrated into their pallets and all was inspected with AME's CMM machine, one of the largest in the industry. Calibration blocks were added to check the probe for repeatability of the machines. These show when and where adjustments are needed to hold .0002 accuracy. A rotary axis check is also done on the 4th axis rotary table to ensure accuracy. Today, 800 different parts are being run through two cells. Monolithic parts are run on one set-up. Now, Bombardier enjoys 91 percent savings on set-up time and a total saving of 81 percent on cycle time over the old dedicated system. "The new system played a major role in allowing us to achieve our Six Sigma goals for this segment of our fabrication process," said Hanus. "We now have improved set-up time, we are producing better quality parts, and saving money in the long run."